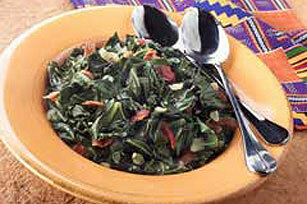 Enjoy Flavorful Southern Collard Greens today! Tossed with bacon bits and garlic, our Healthy Living southern collard greens make a great side dish. Wash collard greens, removing all grit. Remove and discard hard stems. Place greens together in small bunches; roll up. Cut crosswise into wide strips; set aside. Cook bacon in large skillet on medium heat to desired crispness. Remove bacon from skillet with slotted spoon, reserving 3 Tbsp. of the drippings in skillet. Set bacon aside. Add onion and garlic to drippings; cook and stir until tender. Add greens, water, sugar, salt and crushed red pepper to skillet. Reduce heat to low; simmer 45 min. to 1 hour or until greens are tender, stirring occasionally. Stir in bacon. Once opened, wrap bacon package tightly and refrigerate for up to 1 week. Fill clean sink 2/3 full with cold water. Immerse greens, in batches, in water; swish greens gently to remove any grit. Makes 12 servings, about 2/3 cup each.